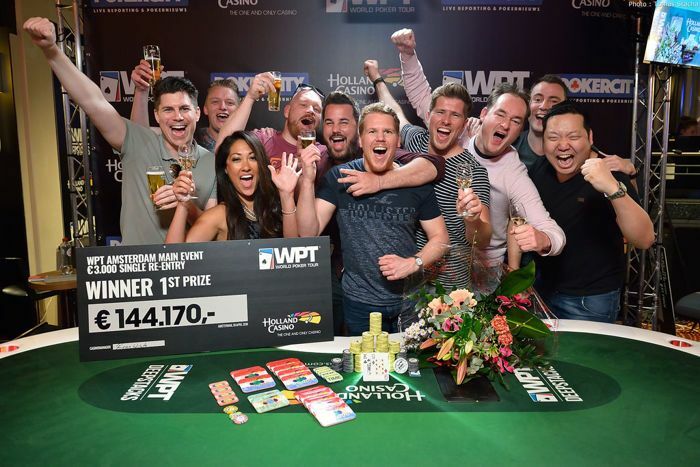 Long-time professional poker player Rens Feenstra has won the World Poker Tour Amsterdam in his home country the Netherlands. Feenstra denied Ema Zajmovic her second WPT title after a long and fierce heads-up battle. 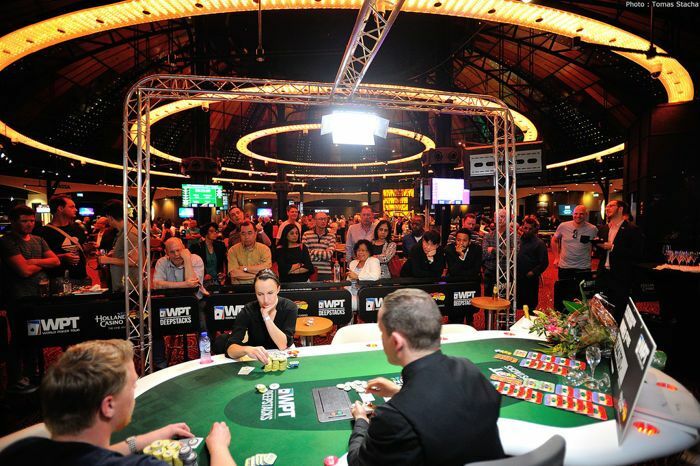 The €3,300 WPT Amsterdam Main Event attracted a field of 207 entries, making for a prize pool of €590,170. 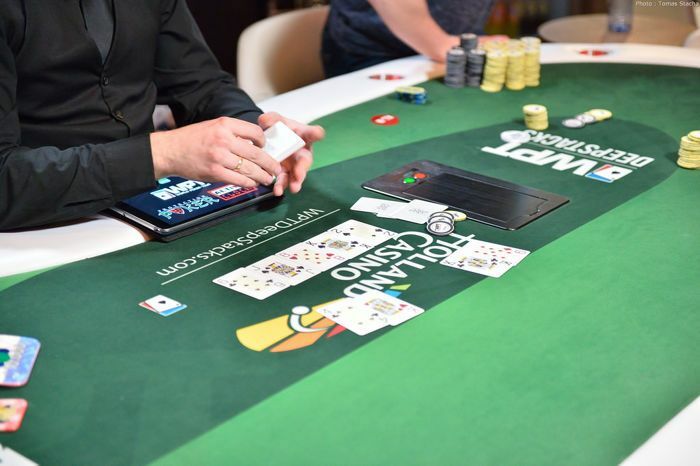 After three days of action, the tournament was down to a final table of 6 players. Rens Feenstra started out with a commanding chip lead, starting with 147 big blinds. His closest competitors Gary Miller and Ema Zajmovic both had "just' 40 big blinds. Still, it would be anything but a smooth ride for Feenstra who would go from big stack to shorty and back. Things started out great for Ema Zajmovic who doubled in one of the first hands of the final table. Things started out great for Ema Zajmovic who doubled in one of the first hands of the final table. She got it in with aces against Feenstra's unimproved ace-queen on a seven-four-three flop. Feenstra had some backdoors but was left drawing dead on the turn, and Zajmovic got back her stack times twice. It took some time before the first player fell. Paul Berende, 9th on the Dutch All Time Money List and a well-known face on the international poker circuit, was the unlucky one to be the first one out the door. He got it in before the flop with pocket sixes against countryman Firoz Mangroe's ace-king. An ace hit the flop, and with blanks on the turn and river, Berende exited in 6th place. Next to go was Louis Salter. 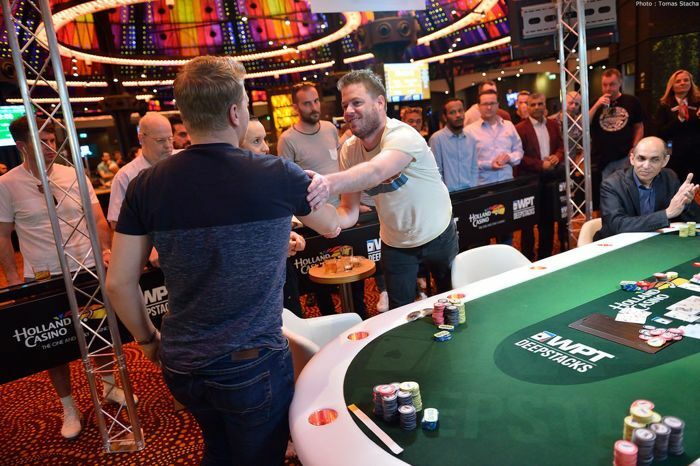 Salter, who won an event at the Master Classics of Poker in Amsterdam in 2014 for €46,919 and made the final table of this very event last year (2nd for €106,710), found himself at risk for his final fifteen big blinds holding ace-jack against the ace-queen of Zajmovic. The latter flopped not just a pair but also a flush draw to leave Salter drawing thin. The turn gave him some outs for a chop, but a blank on the river left him with nothing but ace-high, and he had to settle for 5th place. Some big pots had gone the wrong way for Feenstra leaving him with a mere eight big blinds. With just four players remaining, Feenstra was the shortest stack while Gary Miller was leading before Zajmovic. Some big pots had gone the wrong way for Feenstra leaving him with a mere eight big blinds. He doubled back with king-jack versus Miller's king-seven suited but remained at the bottom of the ranking. While Feenstra started building again, Gary Miller saw his stack dwindle. The one-time chip leader soon was all in and at risk, and things weren't looking too good for him with ace-five versus the tens of Zajmovic. Miller flopped an ace but a ten accompanied the deck's highest card, and Miller was drawing dead by the time a meaningless deuce hit the turn. Just three players remained, and Ema Zajmovic had a commanding lead of 109 big blinds versus the 35 of Mangroe and 12 of Feenstra. Last year, Zajmovic became the first-ever female poker player to win an open World Poker Tour event when she conquered the WPT Playground title for C$241,500 ($183,788). Now, only ten months later, she was in an excellent position to capture her second title. The blind kept increasing, and so did Zajmovic's stack. Feenstra doubled through his countryman Mangroe to even their stacks, but both were still way behind Zajmovic. In a small blind (Feenstra) versus big blind (Zajmovic) situation, the former shoved and the latter called. Feenstra had the goods, though, turning over ace-king against Zajmovic' king-jack. The flop seemed disastrous for Feenstra as a jack hit, but the ten on the turn gave him Broadway to leave Zajmovic drawing to a chop. A meaningless four completed the board, and Feenstra doubled, distancing himself from Mangroe while still behind Zajmovic. It would be Zajmovic who took the last of Firoz Mangroe's chips. Down to just 12 big blinds, the Dutchman shoved with pocket sixes. Initial raiser Zajmovic called with king-nine suited and hit a king on the river to eliminate Mangroe in 3rd place. Leading with 78 big blinds versus 46 big blinds, Zajmovic started the heads up with the advantage. Some pots where she had to give up, and some more missing in three-bet pots, saw Feenstra close the gap. Slowly but steadily, Feenstra increased his stack taking the lead around hand 180 of the day. The momentum was with Feenstra, but that all changed soon after as Feenstra lost three sizable pots in a row to see himself with back to a 19 to 59 big blind disadvantage. It wouldn't be the last time the two would swap positions, as the lead changed about every other couple of hand. As a big bluff failed for Feenstra, he was down to just nine big blinds with 213 hands played for the day. Two double-ups later and the two were back to even, and the heads up continued. It would take a total of four hours and countless swapping of who was holding the lead for the tournament to finish. In the end, Zajmovic became the victim of a set up with a straight over straight situation to become the severe short stack. Not long after, down to just a few big blinds, she called all in as Feenstra shoved from the button. Holding king-four off-suit, Zajmovic was in trouble as Feenstra tabled king-nine off. Both flopped a king but as the turn and river blanked, the kicker played, and Feenstra was crowned the victor. Zajmovic had to settle for 2nd place. 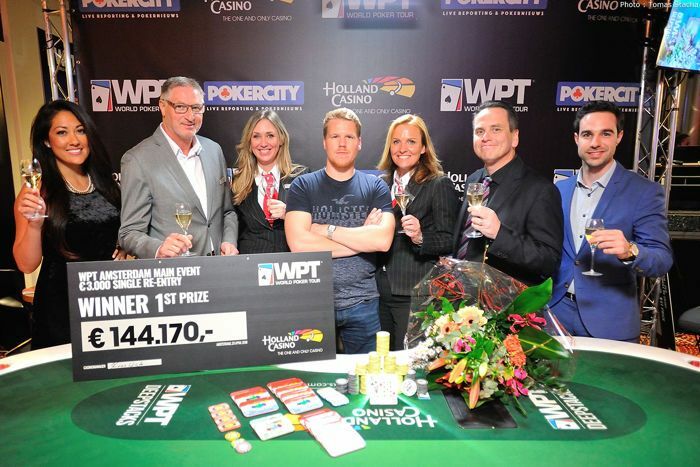 Rens Feenstra took home a prize of €156,370, which includes a ticket for the WPT Tournament of Champions. 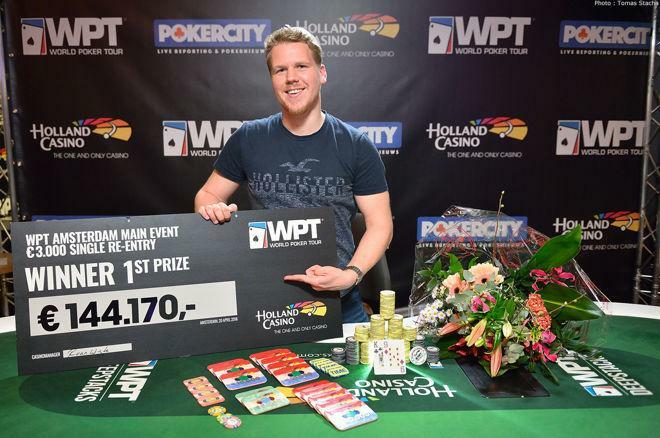 That means Feenstra has €144,170 in his pocket after four days of poker in Holland's capital, and he'll fly to Las Vegas to play in the WPT Tournament of Champions at the end of May with a ticket worth $15,000 (€12,200).